After scoring at an alarming rate for Newcastle United, Andy Cole was a wanted man by managers across the country. Up stepped a certain Alex Ferguson with a bid of around £7 million and Keith Gillespie in exchange for the services of Cole. Kevin Keegan, then Newcastle manager, accepted the bid and just days later Cole was in a United kit. Despite not reproducing any of his Newcastle form in his first few seasons at United, Cole would soon be hitting the back of the net on a regular basis and has won countless trophies at Old Trafford. At present he is playing for Blackburn Rovers in a bid to fight his way back into England's World Cup plans. Having only been signed by Barcelona in 1996, it came as a huge surprise to football fans worldwide when Ronaldo joined Inter Milan just a year later. Ronaldo has been a success wherever he has played so it came as little surprise when his agents manufactured the move for Ronaldo. He had become dismayed by life in Barcelona because of the alleged lies fed to him on the subject of his contract. Despite being an instant success for Inter, Ronaldo has rarely played since the World Cup in 1998. Knee injuries have plagued him but he was fit enough for the Copa America in 1999. He impressed here but upon rejoining Inter for the new season he suffered yet another knee injury. His transfer may have been a huge shock but Barcelona will feel that they cashed in on their prized asset at the right time. During the summer of 2000, Real Madrid were holding their presidential elections. One of the candidates, Florentino Perez, declared that, should he become President of Real Madrid, he would bring Luis Figo to the club. It was a bold statement that was enough for him to be elected. And being true to his word, Perez broke the world record transfer fee by bringing Luis Figo to the club for a fee believed to be around £37 million. Figo had been playing for Real's rivals Barcelona so the transfer sent shockwaves through football. Figo went on to have a magnificent season and guided Real to the Primera Liga title. In the recent match between Real Madrid and Barcelona, Figo scored the second goal in a 2-0 win for Real. After signing for Everton, Nick Barmby needed a good run of form if he was to regain his place in the England set up. Under Walter Smith, Barmby grew in character and is now a much better player because of it. Despite being a right footed player he is extremely comfortable on the left hand side of midfield and it came as no surprise that he had become hot property. In the summer of 2000 there were no shortage of takers for Barmby- there were clubs from London, the Midlands and up North all keen to take him on board. But Barmby only had one team on his mind- Everton's arch rivals Liverpool. Gerard Houllier is a known admirer of the ex-Tottenham man and a move across the Mersey beckoned. Liverpool had stolen their rivals' biggest asset. The transfer caused such a storm that Barmby was forced to pull out of the past two matches at Goodison Park due to fears over his safety. Alan Shearer had just finished a disappointing campaign with Blackburn Rovers when clubs started queing up for his signature. As the summer of 1996 was drawing to a close, there appeared to be two contenders battling it out for the signature of England's top striker. 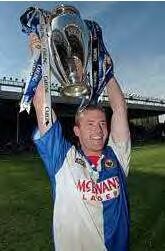 A fee of £15 million had been agreed by Blackburn with both Manchester United and Newcastle. Shearer chose to join the team that he had supported since he was a boy and Newcastle had won the race for Shearer. The fee was a British record and proved to be a huge transfer coup for Newcastle, having only recently lost out in the title race with Man United. Newcastle, in Shearer's first season, would again have to settle for second place. Since then they have won nothing but have reached the FA Cup final twice. Blackburn, on the other hand, have been relegated but, after two seasons in the Nationwide League, are back in the Premiership. The big England defender was one of the hottest properties in Europe when he became a free agent in the summer. Despite Tottenham desperately trying to persuade him to stay, Campbell had the choice of virtually any European club at his disposal. Inter and Barcelona appeared to be locked in a battle for his signature and he was reportedly offered as much as £250,000 a week by one of the clubs. So it came as a huge shock to football, Spurs fans especially, when Campbell signed for Spurs' London rivals Arsenal. Tottenham fans were outraged at this and let their thoughts be known when, during the recent London derby between the two sides, chants of Judas rang through the stadium. When objects were thrown at Campbell during the game and then the Arsenal team bus, it was obvious how much the Spurs fans missed their commanding central defender. Jaap Stam had been signed by Alex Ferguson in a bid to shore up his leaky defence. Stam obliged and, with the help of his colleagues, guided United to the treble and the Premiership title in 3 consecutive seasons. In the summer Stam released his long awaited autobiography, revealing many things about Alex Ferguson. One of these revelations was that Fergie had tapped up Stam whilst the big defender was at PSV. These revelations obviously influenced Ferguson to sell Stam to Italian giants Lazio in a £16.25 million deal. Ferguson stated that the autobiography was not the reason behind the transfer and that it was purely a football matter. Stam has since been replaced by Laurent Blanc, a man who has been the subject of much criticism from the English media. At Lazio, injury has reduced Stam's appearances and the Dutchman recently failed a drugs test. The test showed that Stam had 35 times more than the legal limit of Nandrolone in his system. He has the threat of a possible 2 year ban from football looming. Following the arrival of Ruud Van Nistelrooy at Manchester United, Andy Cole's chances of holding down a place in Alex Ferguson's starting XI were looking bleak. Those chances were starting to look even bleaker when Ferguson changed his system to only incorparate one striker. With a World Cup just round the corner, Cole knew that his only chance to impress Sven Goran Eriksson was by moving clubs. This news alerted several Premiership clubs, most notably Blackburn Rovers, prompting Graeme Souness to table a £7.5 million bid. Cole knew that he would guarantee him first team football and the only apparent stumbling block would be the players wages. This problem was overcome and Cole made an immediate impact for Blackburn, scoring the winner in their Worthington Cup final victory over Spurs. Robbie Fowler had been Liverpool's golden boy for so long. The talented scouser was touted by many as the man to break Ian Rush's goal scoring records. What they didn't count on was a number of bust ups involving Fowler and the Liverpool coaching staff. Fowler found himself slipping down the pecking order and felt that a move would boost his chances of first team football. Leeds came knocking on Liverpool's door and the rest is history. Fowler started off very well at Leeds but is now struggling for form like the rest of his Leeds team mates. December 2001 will be remembered by Robbie Fowler as the month that his love affair with Liverpool ended.